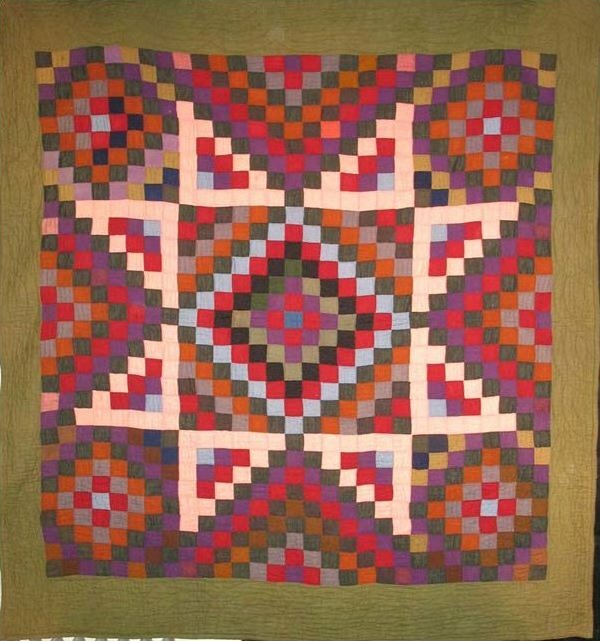 A pattern format shared within a small Lancaster County, PA community of Bowmansville, and also seen in Canadian Mennonite pieced quilt from the late 19th century forward. Distinctive piecing - squares only are orchestrated to create a large scale central element within a surrounding pieced field. Among the examples known, there is variety even in the creation of a center star, seen here in the small Sunshine and Shadow corner elements and the rose strip outlining the Diamond in a Square center of the eight armed star. PA examples are often earth tone cotton 1880s prints, this example is in solid wools, a real find.